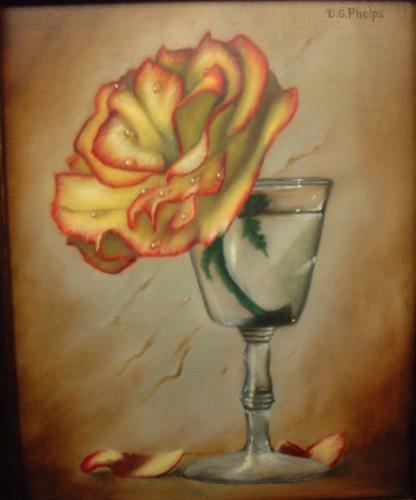 Rose art, roses in fine art, how to paint roses, draw a rose, Rose History. Rose Art, or Roses in Art, the worlds most famous flower in today's art. You’ve found my rose art page! No, this page is not about the art manufacturing company by the same name, but rather, all things roses when it comes to the art world. All kinds of information can be found here on roses. Not only how to create art with roses in drawing and painting them, but you can also launch onto other areas for a more enriching experience with this wonderful flower. No other flower has captivated society as this, the worlds most famous flower! If you're in a real hurry on how to paint roses, click here to see the method I use to capture their beauty. Or if you'd like to see a video demonstration of the process, click here. 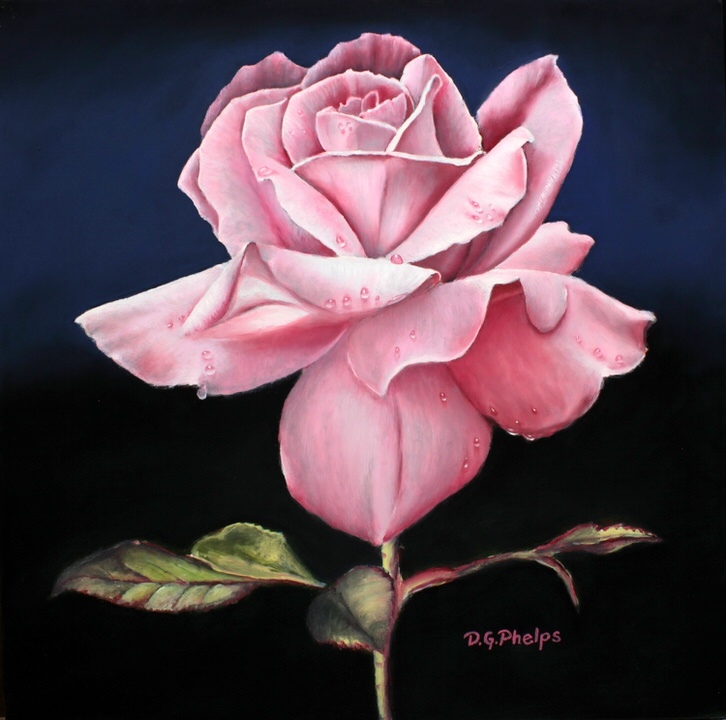 We talk about how to paint and draw rose art, some history and how to grow them here. It's captured my heart as well! As you can see with my work, I like painting them. Roses have been a part of fine art for a long time too! Roses have had a colorful and very long history. We believe the species is over 35-40 million years old based on fossil evidence from Colorado, North America, Europe and Asia. It is thought that these early flowers, which resembled the wild Sweetbrier, were used for food and medicine. They had five petals and were usually either pink or white in color. From these humble beginnings, it is now the most complicated family tree of all known flowers with over 30,000 varieties. The cultivation of this flower we think started in Asia 5000 years ago and they’ve been a part of our experience ever since. Are you interested in more about the rose? Click here to read about some very interesting myths and stories about the rose. Did you know in Roman Times, they wouldn't let folks grow food crops, but rather, roses to fill their lavish pools with petals? Click the link above to find more. Cultivated roses from China were introduced to Europe in the late eighteenth century. These were a repeat blooming variety. From here began the experts splitting between old roses (before 1800) and modern roses (those cultivated and hybridized in England and France during the 19th century). Until that time, old roses were only shades of pink or white (in Europe). Where as the red rose from China came on the scene in Europe after 1800. The Chinese kept written records of their roses. Like to find out long roses have been with us? 100 years? 1000 years? A million years? You gotta find out here! Yellow roses appeared after a Frenchman Joseph Permet-Ducher found a mutant yellow flower. He’d been breeding them for 20 years trying to create one on his own prior to its discovery. Wouldn’t you know it, mother nature always knows best! At this point, only a true blue or true black rose have not been found or created, but both are very close! The rose has been represented in poetry, symbolism, heraldry and art throughout the world. One of the first great symbolism’s was during the War of Roses 15th Century England where the House of York was represented by the white rose, and the House of Lancaster by the red rose. Could you imagine 2 football teams using roses as their mascot! Thanks goodness no! Roses have been used as an aphrodisiac, medicinal purposes, cosmetics, perfumes, aromatherapy and even worshiped! They have inspired musicians, poets, authors and even artists! Did you know the rose became so popular, it became legal tender? Did you know that the color of a rose has a very specific meaning? Click here to find out in greater detail what you would send a friend, and what you would send a lover. No, they are not the same, and you could be sending a very wrong message! For instance, on Mothers Day, you send your wife the red rose and you send your Mum (British for Mom ;) the Pink rose! And your neighbor's wife that just busted her ankle helping coach your kids T-ball game? It better be yellow, or you're in real trouble! Click here to find out why? And just completed, a whole page devoted to Growing your own Roses! Why? So you can have more for your own rose art! I've tried to grow them for years, and basically fed the deer population around here for a long time. Not until I put up that tall fence last year have I preserved the few bushes that I do have. I'll keep you posted on the rose bed's progress as I learn more about how to propagate them. They are indeed a wonderful thing to see from my kitchen sink window. How to draw a rose, or paint a rose! Here's my latest demonstration of a Dusty Pink Rose! There's a short 4 minute intro film to the article and lot's of HD photo's, so click here to check it out! no worries, I'll save your space here. Now to some more good stuff. 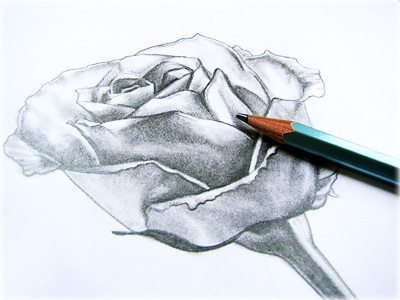 Here are several links to examples on how to get started on your own Rose drawing or painting! 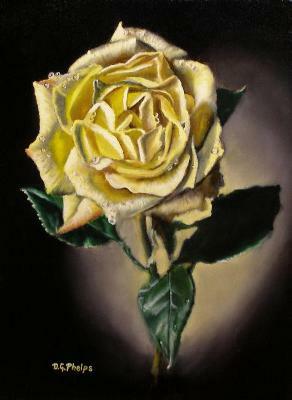 A "From my easel" example on how to draw and paint a rose. Click the picture to get started on something like this in above photo. 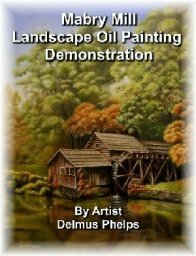 Below is another demonstration, a full feature DVD of the process. 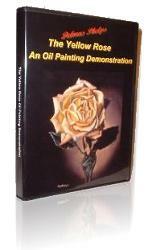 My own product that takes you from start to finish to create this beautiful yellow rose using the indirect Flemish technique of oil painting. Below, a great artist and friend has a wonderful website that explains this drawing in detail and how you can produce it too! On her site the example includes a downloadable for free PDF file for the rose given so you can practice directly on the graph! Go check it out! Click the picture. A fantastic example of using the grid method in drawing a rose from my friends website. 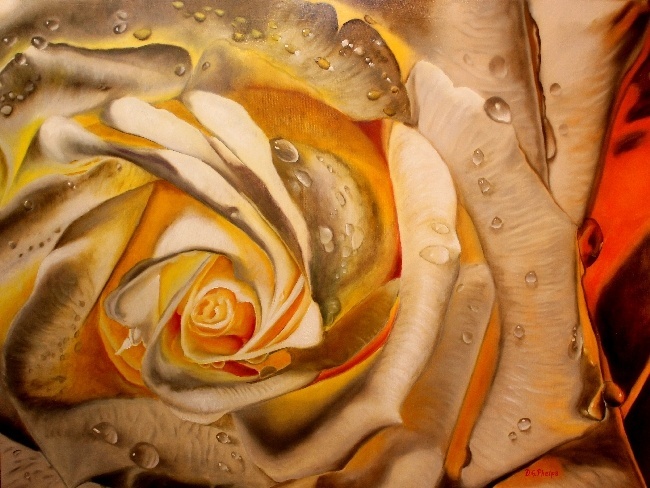 Hopefully you've learned something about rose art and enjoyed some of information given here. Please feel free to come back often! 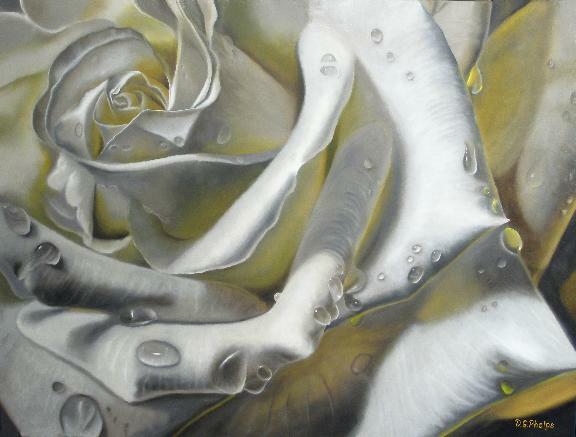 Click here to head back to the top of our Rose Art page.